(C) 2013 Tomáš Lackner. This is an open access article distributed under the terms of the Creative Commons Attribution License 3.0 (CC-BY), which permits unrestricted use, distribution, and reproduction in any medium, provided the original author and source are credited. A new genus and species from Kenya, Afroprinus cavicola is herein described and illustrated and its systematic position is discussed. 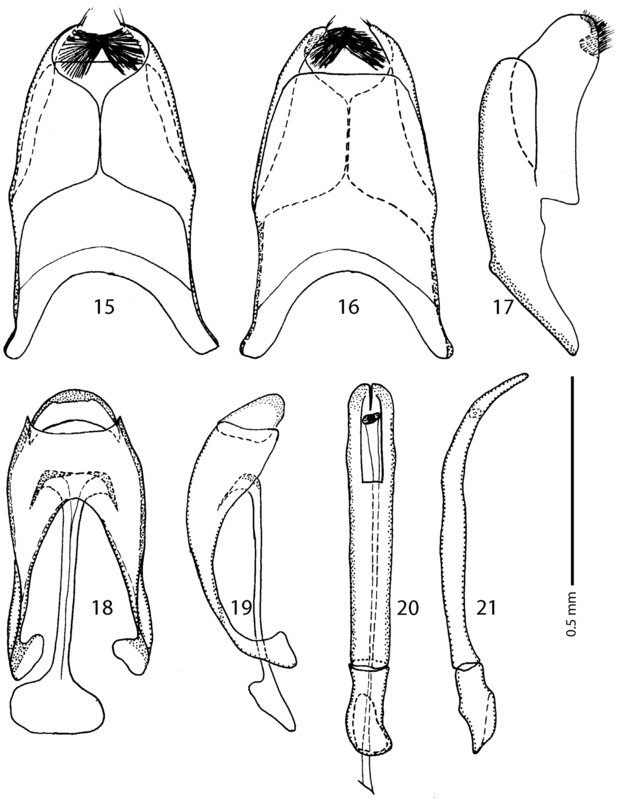 By the prosternal pre-apical foveae connected by marginal prosternal stria it resembles most of the Afrotropical species of the genus Chalcionellus Reichardt, 1932, or some species of the genus Pholioxenus Reichardt, 1932 from South Africa and Namibia. Afroprinus can be distinguished from Chalcionellus chiefly by the lack of pronotal depressions and a coarsely sculptured, non-metallic dorsum; from Afrotropical species of Pholioxenus it can be most easily distinguished by the asetose pronotal hypomeron. The new taxon was discovered in a cave, but lacks obvious troglophilic adaptations. Notes on other Saprininae taxa found in caves are given. An identification key to the genera of Afrotropical Saprininae is provided. The Saprininae of the Afrotropical Region are quite well known and have been studied for many years, and except for descriptions of genera or species scattered in the entomological literature of the past 180 years there are several generic revisions (e.g. Gomy and Vienna 1996), as well as many studies on the histerid fauna of particular countries that also contain data on the Saprininae. Such country studies (in most cases called ‘Contributions to the knowledge’) were mostly published by Gomy (see e.g. Gomy 1978, 1983 or 1986), but also by other authors (e.g. Desbordes 1930 or Penati and Vienna 1996). Despite this, there is still no systematic revision of the Afrotropical Saprininae, or a catalogue to deal specifically with this region. According to the recent world catalogue of Mazur (2011) there are 22 genera and 199 species of Saprininae occurring in the Afrotropical region. However, it is probable that such a large tropical area must house much larger diversity of the Saprininae than the taxonomic literature indicates. During a visit to the Natural History Museum, London, UK in 2009 I have examined a series of apparently unknown Saprininae specimens, identified as Gnathoncus sp. After having performed a phylogenetic analysis of the Saprininae subfamily (Lackner, unpublished), I can conclude that this is an unknown taxon belonging to a new genus. The prosternal pre-apical foveae connected by the marginal prosternal stria found in this taxon is a rare feature among the Old World Saprininae and it is more likely to be found among the members of Euspilotus Lewis, 1907, common to the Neotropical region (Lackner, pers. observ.). However, in the Afrotropical region there are Saprininae that have the prosternal pre-apical foveae connected by the marginal prosternal stria. These taxa are found among ill-defined and most likely polyphyletic genera Chalcionellus Reichardt, 1932 and Pholioxenus Reichardt, 1932. Revisions of both afore-mentioned genera are badly needed. In this contribution to the systematics and taxonomy of the Saprininae a new genus and its type species are described and the systematic position of the new genus in the Saprininae subfamily is discussed. A tentative key to the genera of the Afrotropical Saprininae is provided. TLAN	Tomáš Lackner’s collection, temporarily housed at Naturalis Biodiversity Centre, Leiden, Netherlands. EW	maximal width between outer margins of elytra. Body length 2.125–2.375 mm, dorsal surface entirely punctate; cuticle dark brown to black, without metallic luster, frontal and supraorbital striae present, well developed; sensory structures of antennal club in form of small sensory area and corresponding vesicle situated on internal distal margin; pronotal hypomeron asetose; elytral disc with four long carinate dorsal elytral striae, fifth stria occasionally present on fourth elytral interval; apex of prosternal process convex, prosternal pre-apical foveae large and deep, connected apically by marginal prosternal stria; carinal prosternal striae shortened apically, not united anteriorly; lateral prosternal striae terminating in large deep prosternal pre-apical foveae; meso-metaventral sutural stria present, undulate. Venter asetose. The general appearance of Afroprinus somewhat resembles that of Hypocacculus, differing chiefly in the large prosternal pre-apical foveae connected by the deep marginal prosternal stria and in the marginal pronotal stria that in dorsal view is visible along its entire length. By the convex apical third of the prosternal process and by the prosternal pre-apical foveae connected by the marginal prosternal stria Afroprinus can also be confused with several Afrotropical species of the genera Chalcionellus or Pholioxenus. It differs from those species of Chalcionellus that have the prosternal pre-apical foveae connected by the marginal prosternal stria by the sculpture of dorsal surface, which is metallic and much coarser in Afroprinus and by lacking the pronotal depressions of Chalcionellus. From those species of Afrotropical Pholioxenus (mainly from South Africa and Namibia) that likewise have their prosternal pre-apical foveae connected by marginal prosternal stria, Afroprinus differs by the asetose pronotal hypomeron and much coarser and denser elytral punctuation. The type series of Afroprinus cavicola has been found on bat droppings in a Kenyan cave. The generic name is a combination of the genus name ‘Saprinus’ with a prefix derived from the continent of Africa. Gender masculine. Holotype, ♂, side-mounted on a triangular mounting card with male genitalia glued to the same card; “KENYA: / Chyulu Hills / Univ. of Nairobi” [written]; “bat droppings / in cave” [written]; “Brit. Mus. / 1972-215” [printed-written]; “Gnathoncus sp. / P.M. Hammond / det. 1972” [written-printed]; “09-071” [yellow label, pencil-written, added during the present study]; “Afroprinus / cavicola / n. gen. & sp. / HOLOTYPE / det. T. Lackner 2010” [red label, written] (NMH). Paratypes, 4 ♂♂ and 2 ♀♀, idem, but without the identification label by P.M. Hammond (NMH; 1 ♂ PT in TLAN). Male and female.Body length: PEL: 2.125–2.375 mm; APW: 0.75–0.875 mm; PPW: 1.625–1.75 mm; EL: 1.375–1.50 mm; EW: 1.875–2.00 mm. Body (Figs 1, 2) ovoid, convex, ventral surface slightly flattened, cuticle matte, dark brown; legs, mouthparts and antennomeres I and II rufous; remaining part of antenna somewhat lighter. Antennal scape (Fig. 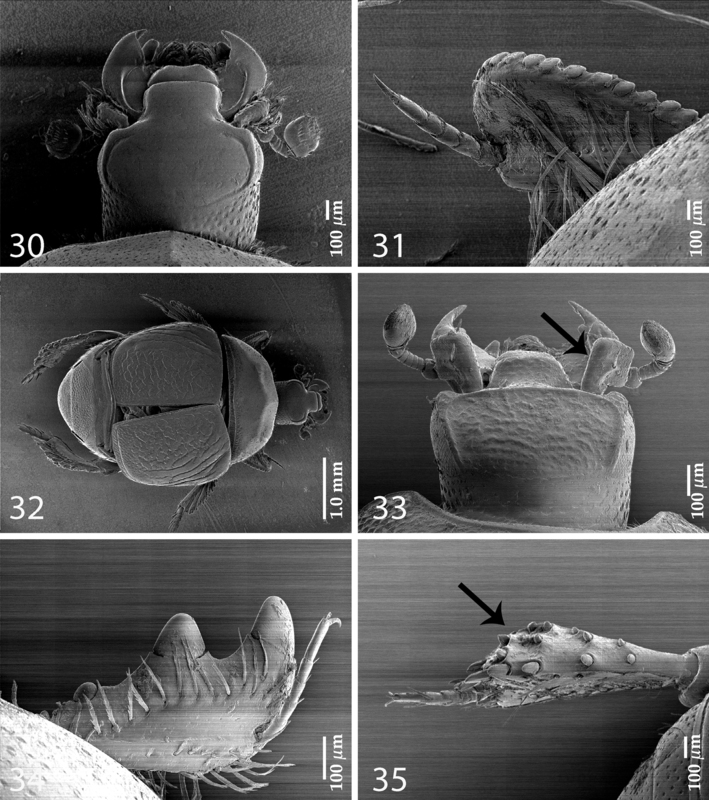 4) with several short setae; antennal club (Figs 3, 14) round, without visible articulation, somewhat flattened dorso-ventrally; approximately distal half of its surface with thick short sensilla; proximal half with imbricate microsculpture, sensilla absent; sensory structures of antennal club (Fig. 14) with tiny sensory area accompanied by a tiny stipe-shaped vesicle on internal distal margin of antennal club. Mouthparts. Mandibles (Fig. 12) with rounded outer margin strongly curved inwardly, apically pointed; sub-apical tooth on inner margin of left mandible large, almost perpendicular; disc of labrum (Fig. 13) convex, labral pits each with two setae; terminal labial palpomere elongate, four times as long as broad; cardo of maxilla with several short setae, stipes triangular, with three long setae; mentum quadrate, anterior margin with deep median notch, anterior and lateral margins with a row of sparse short ramose setae, disc of mentum with several short setae; terminal maxillary palpomere (Fig. 5) elongate, five times as long as broad, approximately 2.5 times as long as penultimate palpomere. Anterior margin of clypeus (Fig. 4) slightly elevated, surface punctate, slightly depressed medially; frontal stria well impressed, curved outwardly, carinate, complete; continued as carinate supraorbital stria; disc of frons (Fig. 4) entirely densely and coarsely punctate, punctures separated by spaces shorter than half of their diameter, sparser near margins; eyes flattened, visible in dorsal view. Pronotal sides (Fig. 1) moderately narrowing anteriorly, anterior angles blunt; marginal pronotal stria complete, slightly carinate, visible along its entire length in dorsal view; pronotal disc entirely punctate, punctures separated by spaces 1-2 times as wide as puncture diameter; pronotal hypomeron setose; scutellum small, inconspicuous. Elytra: epipleuron with fine scattered punctures; marginal epipleural stria complete; marginal stria straight, well impressed, carinate, continued as intermittent apical stria. Humeral stria well impressed on basal third, somewhat obliterated by coarse punctuation; inner subhumeral stria well developed, visible as long median fragment posteriorly nearly reaching first dorsal stria; with carinate dorsal striae 1-4 (some specimens with a vague fragment of fifth stria on fourth elytral interval); striae 1-3 sub-equal in length, posteriorly reaching approximately five-sixths of elytral length, fourth dorsal stria slightly shorter, anteriorly well-connected with carinate sutural stria; sutural stria straight, well impressed, posteriorly connected with fragmented apical stria; between sutural stria and suture with row of microscopic punctures. Entire surface coarsely and densely punctate, punctures separated by spaces sub-equal to their diameter or shorter, periscutellar area with slightly sparser punctuation; interspaces with isodiametric microsculpture. Propygidium (Fig. 7) completely exposed, its punctuation similar to that on elytra and pygidium. Antero-median margin of prosternum (Fig. 8) straight, rounded laterally; pre-apical foveae deep, connected by marginal prosternal stria; prosternal process apically convex, rounded; carinal prosternal striae (Fig. 8) almost parallel-sided, apically reaching approximately half-length of prosternal process; lateral prosternal striae carinate, terminating in large pre-apical foveae; entire prosternal process with scattered punctures. Antero-median margin of mesoventrite straight; discal marginal mesoventral stria well impressed, emarginate anteriorly, complete; disc of mesoventrite with scattered round punctuation; meso-metaventral sutural stria undulate. Intercoxal disc of metaventrite slightly convex, entirely covered with scattered fine punctures separated by spaces 2-3 times as wide as their diameter, anteriorly punctures becoming coarser and denser, in male more so; lateral metaventral stria (Fig. 10) straight, carinate, almost reaching metacoxa; lateral disc of metaventrite slightly impressed, with deep round punctures; metepisternum + fused metepimeron with distinctly denser punctures; marginal metepisternal stria complete, deeply impressed. Intercoxal disc of first abdominal sternite with complete lateral striae, disc with scattered fine punctures, separated spaces as wide as 3 times puncture diameter. Protibia (Fig. 11) slightly dilated; outer margin with 6 short teeth, each topped by short rounded denticle gradually reducing in size towards base of tibia, followed by a minute denticle; setae of outer row sparse, short; setae of median row even shorter; protarsal groove deep; anterior protibial stria carinate, shortened apically; protibial spur minuscule, approximate to tarsal insertion; outer part of posterior surface of protibia smooth, demarcated from median part by distinct straight line; posterior protibial stria complete, terminating in two inner posterior denticles, separating median part of posterior surface from smooth inner part of posterior surface; inner margin of protibia with dense row of lamellate setae that gradually increase in size towards tibial apex. Mesotibia (Fig. 6) slender, outer margin with a single row of short denticles gradually increasing in size towards tibial apex; setae of outer row moderately long, sparse, lightly sclerotized; setae of median row much thinner and sparser; posterior stria almost complete and only slightly shortened distally; anterior surface with a row of short denticles on outer margin, surface otherwise smooth; anterior stria complete; apical spur short; apical margin of with several stout denticles; claws of terminal tarsomere slightly bent, shorter than half tarsomere length. Metatibia (Fig. 9) more slender than mesotibia, its denticles sparser than those of mesotibia, otherwise similar to it. Male genitalia: Eighth sternite (Figs 15–16) divided longitudinally; vela present, with dense brush of long setae; apex of eighth sternite with one or two short setae (Fig. 15); eighth tergite and eighth sternite fused laterally (Fig. 17). Ninth tergite (Fig. 18) not longitudinally divided medially; spiculum gastrale (Fig. 18) almost parallel-sided, abruptly dilated apically; basal end broadly rounded, spatulate. Aedeagus (Figs 20–21) almost parallel-sided, slightly broadening apically, in apical third curved ventrad; basal piece short, ratio of its length to length of parameres 1 : 4; parameres fused almost along their basal two-thirds. Afroprinus cavicola gen. et sp. n., SEM micrographs. 1 habitus, dorsal view 2 ditto, ventral view 3 antennal club, dorso-lateral view 4 head, dorsal view 5 ditto, ventral view 6 mesotibia, dorsal view 7 propygidium and pygidium 8 prosternum 9 metatibia, dorsal view 10 lateral disc of metaventrite + metepisternum 11 protibia, dorsal view. Afroprinus cavicola gen. et sp. n., male terminalia. 15 eighth sternite and tergite, ventral view 16 ditto, dorsal view 17 ditto, lateral view 18 ninth and tenth tergites, dorsal view; spiculum gastrale, ventral view 19 ninth, tenth tergites and spiculum gastrale, lateral view 20 aedeagus, dorsal view 21 ditto, lateral view. This key is preliminary and in future will be revised, especially in regard to the ill-defined and heterogeneous genera Saprinus, Hypocacculus, Chalcionellus and Pholioxenus. Pholioxenus shows a discontinuous distribution, with about two-thirds of its species living nidiculously inside burrows and faecal chambers of small ground mammals in the Palaearctic region and one-third found free-living in South Africa, Namibia etc., with a single species of unknown biology (Pholioxenus trichoides Kapler, 1992) described from north Sudan (Mazur 2011). Revision of the genus Pholioxenus is in preparation (Lackner, manuscript). Subgenera, with exceptions of Hesperosaprinus and Neosaprinus of the Nearctic and mainly Neotropical genus Euspilotus which are pertinent to this key, are excluded, since they fall within the limits of their respective genera. Limits of the Afrotropical region are according to Löbl and Smetana (2004) and encompass the entire continent of Africa south of Sahara, the island of Madagascar, along with Cape Verde Archipelago, São Tomé & Príncipe, Seychelles, Réunion, Comoros, island of Saint Helena and other smaller islands. 27 (26) Pronotal depressions absent, species not metallic, punctuation of dorsum very coarse and dense (Fig. 1) Afroprinus gen. n.
Assorted Saprininae characters. 22 Saprinus (Pilisaprinus) verschureni Thérond, 1959, prosternum 23 Euspilotus (Neosaprinus) rubriculus (Marseul, 1855), prosternum 24 Euspilotus (Hesperosaprinus) modestus (Erichson, 1834), prosternum 25 Pachylopus dispar Erichson, 1834, female, ventral view 26 Pachylopus dispar Erichson, 1834, protibia, dorsal view 27 Neopachylopus secqi Kanaar, 1998, protobia, dorsal view 28 Parahypocaccus weyerichi Vienna, 1995, prosternum 29 Parahypocaccus weyerichi Vienna, 1995, head, dorsal view. Assorted Saprininae characters. 30 Paraphilothis mirabilis Vienna, 1994, head, dorsal view 31 Paraphilothis mirabilis Vienna, 1994, protibia, dorsal view 32 Paraphilothis mirabilis Vienna, 1994, habitus, dorsal view 33 Dahlgrenius aurosus (Bickhardt, 1921), head, dorsal view 34 Exaesiopus laevis Thérond, 1964, protibia, dorsal view 35 Exaesiopus laevis Thérond, 1964, metatibia, dorsal view. In the recently performed phylogenetic analysis focused on the resolving the relationships of the higher taxa of the Saprininae subfamily, this new genus has been placed within a large and unresolved clade of genera that all share a unique synapomorphy of a single, pear-shaped vesicle inside the antennal club, as well as several weaker synapomorphies, which are possibly homoplasies (Lackner, unpublished). Within that large unresolved clade, Afroprinus was placed in a small dichotomy, sister to a South African member of the genus Pholioxenus, Pholioxenus oleolus Thérond, 1965 that was included in the analysis to test the monophyly of the genus Pholioxenus. Both Afroprinus and Pholioxenus oleolus are characterized by the putatively plesiomorphic feature of prosternal pre-apical foveae connected by marginal prosternal stria. Such a feature, which might also represent a convergence, is normally present among the members of the subgenera Hemisaprinus and Neosaprinus of the genus Euspilotus and its absence among other members of Pholioxenus points to the possible polyphyly of the genus. In the analysis, Hemisaprinus and Neosaprinus came out closer to the root of the cladogram unrelated to the large clade mentioned above. Cavernicolous habits are not common in the Histeridae, with most of the troglophilous genera belonging to subfamilies and tribes containing mostly microhisteridae: Dendrophilinae: Bacaniini (e.g. genera Troglobacanius Vomero, 1974, or Sardulus Patrizi, 1955), Abraeinae: Abraeini (genus Spelaeabraeus Moro, 1957), Acritini (genus Spelaeacritus Jeannel, 1934), see also Kovarik and Caterino (2005) for more thorough enumeration of the cavernicolous histerids. 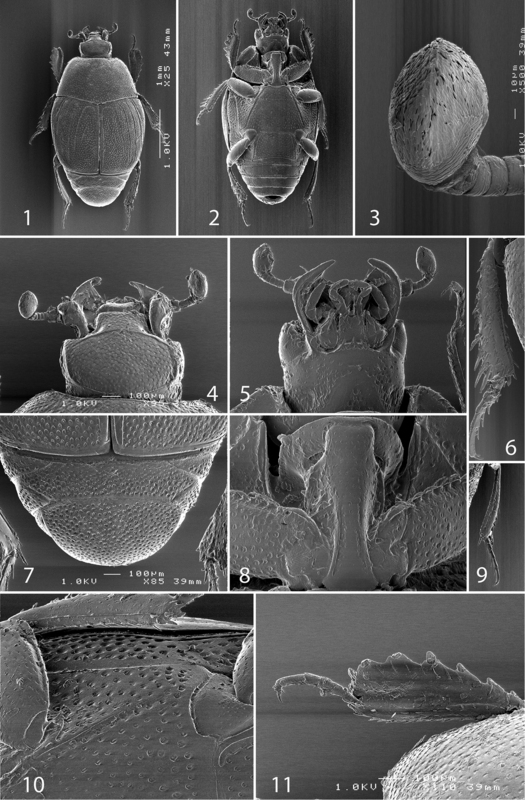 Speleacritus anophtalmus Jeannel, 1934 even shares some of the morphological adaptations that are typical of cavernicolous beetles: elongate body appendages, quasi-prognathous head, and fused elytra (Kovarik and Caterino 2005). In the Saprininae there are currently several genera whose species are known to have been collected inside caves: Gnathoncus Jacquelin du Val, 1858 (Gnathoncus cerberus Auzat, 1923 and Gnathoncus cavicola Normand, 1949), Tomogenius Marseul, 1862 (Tomogenius incisus (Erichson, 1842); Tomogenius ripiciola (Marseul, 1870); Tomogenius motocola Mazur, 1990 and Tomogenius papuaensis Gomy, 2007)), Euspilotus Lewis, 1905 (Euspilotus (Neosaprinus) rubriculus (Marseul 1855); Euspilotus (Neosaprinus) scrupularis (J.E. LeConte, 1859); Euspilotus (Neosaprinus) burgeoisi (Desbordes, 1920); Euspilotus (Neosaprinus) turikensis Kanaar, 1993 and Euspilotus (Hesperosaprinus) modestus Erichson, 1834 and Euspilotus (Hesperosaprinus) sterquilinus (J.L. LeConte, 1859) (Kovarik & Caterino 2005 and Lackner, unpublished)). None of these taxa exhibit any morphological adaptations to the cavernicolous way of life and according to Kovarik & Caterino (2005), they are attracted to bat guano accumulated inside these caves and presumably feed on fly larvae developing in it. The habitat of Afroprinus, which is similar to the genera mentioned above, is atypical for the members of the large and poorly resolved clade of the yet unpublished phylogeny of the Saprininae subfamily. Typically, its other members, such as the genus Chalcionellus are predators inhabiting open areas and are normally found on dung or carcasses in dry or semiarid steppe zones, on shoals of rivers or beaches. This group contains all of the hitherto known true psammophiles, as well as an obligate termitoxene. Regarding the Saprininae collected in caves in the Afrotropical region apart from Afroprinus cavicola, a single non-native species, Euspilotus (Neosaprinus) rubriculus (Marseul, 1855) has also been collected inside a cave. This Neotropical species (for details on its distribution see Mazur 2011: 192) has been introduced to the French island of La Réunion in the Indian Ocean and to the British Overseas Territory of Saint Helene in the Atlantic Ocean (Desbordes 1919; Thérond 1972; Gomy 2005). Specimens collected on La Réunion have been found inside a lava tube in the faeces of the Mascarene Swiftlet (Collocalia francica Gmelin, 1789) (Gomy 2005). Gomy (2005) concluded that its cavernicolous habitat “n’a rien d’exceptionel” and hypothesized that this species could have come from Brazil with a shipment of some kind of legumes, probably soy beans or corn. The species seems to be well established on the island, since it has been collected in the same environment again (Gomy 2005). Perhaps the above-mentioned Saprininae taxa (including Afroprinus) that have been collected inside caves show an early stage of colonisation of the cave environment by Saprininae histerids. Saprininae are one of the most ecologically plastic histerids, occurring inside mammals’ burrows, ant nests, on decomposing vegetation, on coastal wrack, deep under shifting sands, and even on flowering plants (see Lackner 2010 for details on Saprininae biology). The discovery of this peculiar new genus inside an African cave proves that our knowledge of Afrotropical Saprininae is still incomplete. I am indebted to my former supervisor Masahiro Ôhara (Sapporo, Japan) for various help during my stay in Sapporo. My wife Pepina Artimová is thanked for help with Adobe Illustrator CS4 and the Latin specific epithet of this new genus. Paweł Jałosziński (Wroclaw, Poland) is acknowledged for help with the earlier versions of this paper. Thanks are due to the curator of the institute mentioned above, Roger Booth, for his help with the specimens. I am likewise thankful to the two anonymous reviewers as well as the editor of Histeroidea of Zookeys for their comments and critical remarks, which undoubtedly produced a better work. This research was supported by the Internal Grant Agency (IGA n.20124364) Faculty of Forestry and Wood Sciences, Czech University of Life Sciences Prague, Czech Republic. Desbordes H (1919) Le Saprinus (Euspilotus) gnathoncoides Bickh. à l’île de Saint-Hélène. Bulletin de la Société Entomologique de France 5: 99. Desbordes H (1930) Contribution a l’étude de la faune du Mozambique. Voyage de M.P. Lesne (1928-1929). 2e note - Colèoptéres Histeridae.Bulletin du Museum D’Histoire Naturelle(2)2: 532–545. Gomy Y (1978) Coléoptères Histeridae de l’archipel des Comores. Mémoires du Muséum (N.S. ) série A, Zoologie 109: 85-101. Gomy Y (1983) Les Coléoptères Histeridae des îles Mascareignes. Annali del Museo Civico di Storia Naturale di Genova. LXXXIV: 269–348. Gomy Y (1986) Nouvelle contribution à la connaissance des Histeridae des îles du Cap Vert (Col.). Courier Forschungsinstitut Senckenberg 81: 25-39. Gomy Y (2005) Euspilotus (Neosaprinus) rubriculus (Marseul, 1855) espèce nouvelle pour la faune de l’île de la Réunion (Coleoptera, Histeridae). Nouvelle Revue d’Entomologie (N. S. ) 22 (1): 33-34. Gomy Y, Vienna P (1996) Revisione del genere Terametopon Vienna e descrizione di una nuova specie di Namibia (Coleoptera, Histeridae). Nouvelle Revue d’Entomologie (N. S. ) 13 (4): 325-331. Kovarik PW, Caterino MS (2005) Histeridae Gyllenhal, 1808. Pp. 190–222. In: Beutel RG, Leschen RAB (Eds)Handbook of Zoology. Part 38, Coleoptera, Vol. 1: Morphology and Systematics. Walter de Gruyter, Berlin, 578 pp. Lackner T (2009) Revision of the genus Terametopon, with description of new species (Coleoptera: Histeridae). Folia Heyrovskyana, Series A 17 (2): 43-72. 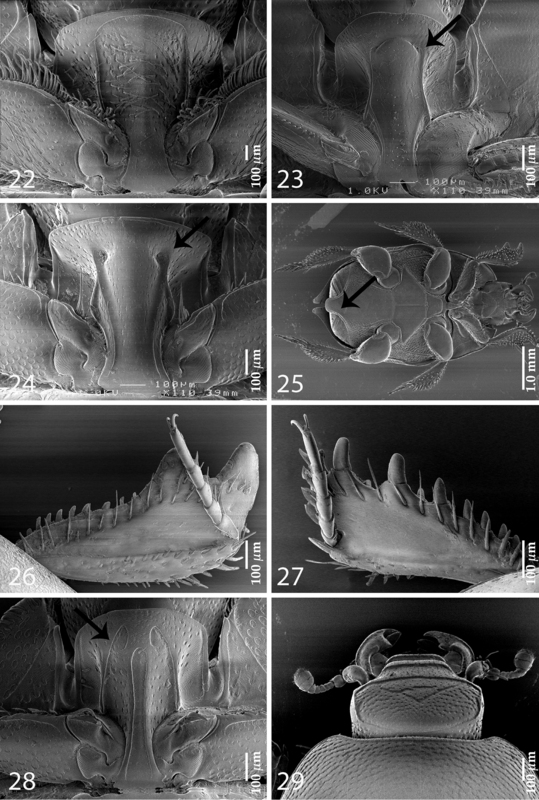 Lackner T (2010) Review of the Palaearctic genera of Saprininae (Coleoptera: Histeridae). Acta Entomologica Musei Nationalis Pragae 50(Supplementum): 1–254. Lackner T (2012) Revision of the genus Xenonychus Wollaston, 1864. Acta Entomologica Musei Nationalis Pragae 52 (1): 147-159. Lackner T (2013) First morphology-based phylogeny of the Saprininae subfamily (Coleoptera: Histeridae) reveals interesting shifts in the biology of the subfamily (manuscript). Löbl I & Smetana A (2004) Catalogue of Palaearctic Coleoptera, Vol. 2, Hydrophiloidea-Histeroidea-Staphylinidea. Apollo Books, Stenstrup, 942 pp. Mazur S (2011) A concise catalogue of the Histeridae (Coleoptera). Warsaw University of Life Sciences, SGGW Press, Warsaw 332 pp. 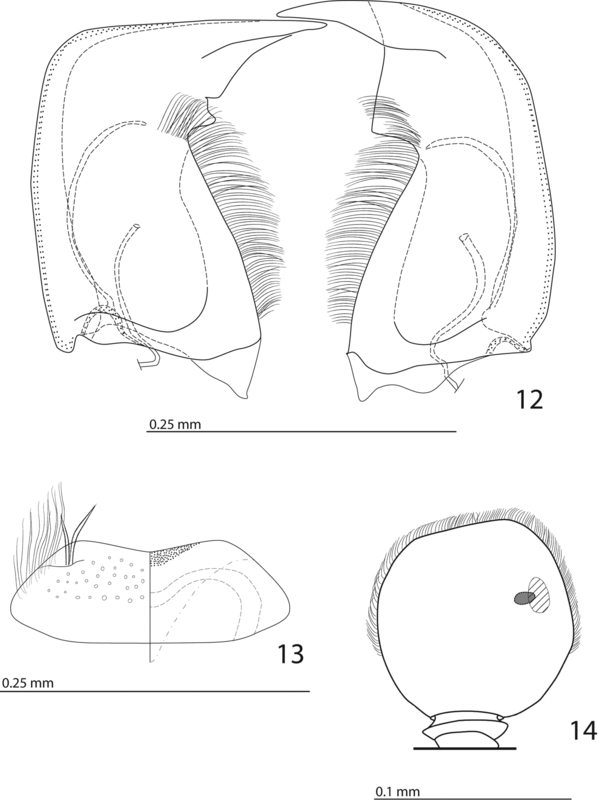 Ôhara M (1994) A revision of the superfamily Histeroidea of Japan (Coleoptera). Insecta Matsumurana (N. S. ) 51: 1-283. Olexa A (1984) Revision der Arten der GattungPholioxenus Reichardt (Coleoptera: Histeridae). Acta Entomologica Bohemoslovaca 81: 111-131. Penati F, Vienna P (1996) Contributo alla conoscenza dell’isteridofauna della Tanzania e descrizione di due nuove specie del genere Hypocacculus Bickhardt (Insecta, Coleoptera, Histeridae). Bollettino del Museo Civico di Storia Naturale di Venezia 45: 59-70. Thérond J (1965) Sur quelques Histeridae (Coleoptera) préservés au Transvaal Muséum. Annals of the Transvaal Museum 25(2): 14 pp. Thérond J (1972) La Faune Terrestre De l’île De Sainte Hélène. Annales Musée Royal de l’Afrique Centrale, ser. 8 (Sciences Zoologiques) 192: 87–90. Vienna P, Penati F (1996) Contributo alla conoscenza dell’isteridofauna della Tanzania e descrizione di due nuove specie del genere Hypocacculus Bickhardt (Insecta, Coleoptera, Histeridae). Bollettino del Museo Civico di Storia Naturale di Venezia 45: 59-70. 1 The species Xenonychus tridens (Jacquelin du Val, 1852) also known from several sub-Saharan countries (Chad, Mauritania and Niger) as well as from the Cape Verde Archipelago has variable frontal and supraorbital striae, which are mostly present. This species possesses well-developed prosternal pre-apical foveae and setose elytral epipleuron. The other African species, Xenonychus somaliensis (Thérond, 1963) known only from Somalia, lacks frontal and supraorbital striae altogether, but has likewise well-developed pre-apical foveae and setose elytral epipleuron (see also Lackner 2012 for details). 2 Species Neopachylopus secqi Kanaar, 1998 recorded from Djibouti possesses extremely small pre-apical foveae visible only with strong magnification. 3 Several species of Pholioxenus do not have their pre-apical foveae connected by marginal prosternal stria. In this regard, they resemble species of the genus Hypocacculus. Limits of both genera are unclear and highly subjective, pending the revision of both genera. 4 Exception Chalcionellus io Mazur, 1993.